A Point Hope Thanksgiving or Do You Have Turkeys North of the Arctic Circle? Translucent pink Muktuk (whale skin and blubber), whale meat, and whole Arctic grayling were passed out to guests at the Point Hope Thanksgiving feast. Like Shishmaref, the residence of Point Hope generally don’t have big family Thanksgiving celebrations at home. It is a community event. Turkeys and hams flood into the village in preparation for the big feast. (Yes, we do get turkeys north of the Arctic Circle.) Anyone who volunteered an oven received either a turkey or a ham to prepare. We received a 22 pound ham which we cooked and delivered to the school gym. Large quantities of traditional dishes such as stuffing, candied yams, corn and cranberry sauce were brought in to the school pot-luck style. By 4 p.m., volunteers had carved turkeys and hams and all the side dishes were readied to be served. After key community members gave speeches expressing thanks, the village was ready to share the meal. The first course? 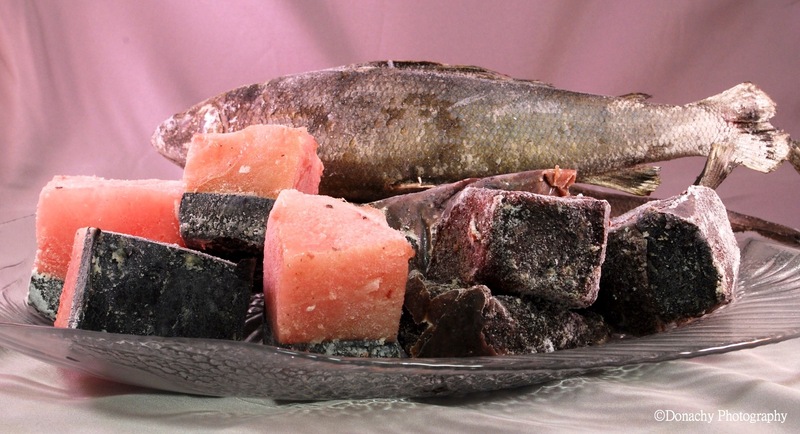 Muktuk (the layer of whale skin attached to the pink blubber shown in the above photo) and chunks of frozen whale meat. Many people brought out sharp knives and small containers of seasoned salt and immediately carved into their frozen chunks of whale. Others, like us, had brought Ziplock bags in order to save the pieces to eat later at home. Both muktuk and whale meat are traditionally eaten raw, boiled, or fried. We talked to the owner of the local restaurant who suggested slow cooking the whale meat in a stew. Sounds like a good idea. Tune in later for that culinary feat. The community also shared whole frozen grayling, dolly varden, and big chunks of salmon. Of course, the elders were served first, but there was plenty to go around to everyone. The next course featured platefuls of traditional Thanksgiving fare. Seated around the perimeter of the school gym on the floor and in chairs brought from home families and friends engaged in conversations. There were probably 500 people altogether. At one end of the gym, tables covered with huge sheet cakes were waiting to be cut and served for dessert. Obviously, Thanksgiving is not a traditional Inupiat celebration. In our readings of Alaska history and in conversations with history buffs, we’ve learned that the Inupiat people had celebrations and traditions similar to many of the traditions that the missionaries introduced several decades ago. The similarities made it easy for the Inupiat to adopt new holidays. For example, the divvying up of whale meat was already a fall tradition. Folding Thanksgiving into this tradition was logical. Did you eat the muktuk? What did you think. Maybe you blogged about it in a later entry, but I’m starting at the earliest and working my way to the present. The *potluck* sounds like it was a wonderful gathering with yummy food. We blogged about muktuk back in April (we were given a sample when we were living in Shishmaref). We served it sashimi style–with soy sauce and a little wasabi–and found the pink, blubbery part of it to be flavorful.